Calculations at a salinon. 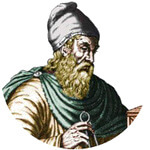 The salinon was introduced by Archimedes, it is formed by a semicircle with the radius R, on whose base another smaller semicircle with radius r in opposite orientation is centrally attached. Left and right of this smaller semicircle, another semicircle with the radius s is removed so that the straight lines disappear. 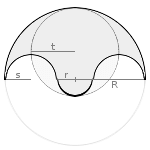 The salinon has the same area as the inscribed circle with the radius t and has the same perimeter as the circle with the radius R.
Enter [R and r] or [s and t] and choose the number of decimal places. Then click Calculate. Radiuses and perimeter have a one-dimensional unit (e.g. meter), the area has this unit squared (e.g. square meter).